Many Roman remains were discovered beneath the City of London in the 19th century. This pavement was discovered just outside the Bank of England, 11 feet below the surface. 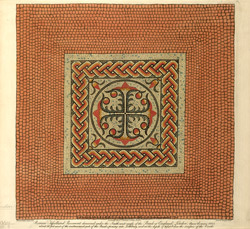 The study of classical remains was fashionable at the time and beautiful tessellated pavements were considered worthy of recording.